David Beasley, the United Nations World Food Program (WFP) executive director, speaks during a press conference in Seoul on May 15, 2018 after his recent visit to North Korea. The head of the United Nations World Food Program (WFP) on Tuesday said the North Korean leadership is hopeful that following a possible denuclearization deal, the international community will increase humanitarian aid for millions of people in the country who are living in poverty and suffering from malnutrition. “There is a tremendous sense of optimism by the leadership, by the people I met with, in the hopes that they will be turning a new chapter in their history, a new page,” said David Beasley, the Executive Director of the WFP during a briefing in Seoul. 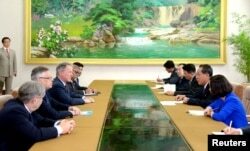 Vice Premier and Minister of Agriculture Ko In Ho meets David Beasley, U.N. World Food Programme's Executive Director, in this undated photo released by N. Korea's Korean Central News Agency (KCNA) in Pyongyang, May 11, 2018. The WFP director visited North Korea for four days last week, spending two days in Pyongyang and two visiting rural areas outside the capital. Beasley said he was given “remarkable” access during his visit to the restrictive state where contact with foreigners is tightly controlled. Government minders also accompanied him during his visit. Beasley, a former governor of the U.S. state of South Carolina, was nominated to head the WFP last year by U.S. Ambassador to the U.N. Nikki Haley, who is also a former South Carolina governor. 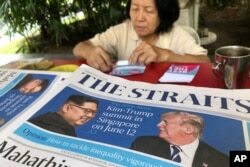 FILE - A news vendor counts her money near a stack of newspapers with a photo of U.S. President Donald Trump, right, and North Korea's leader Kim Jong Un on its front page on May 11, 2018, in Singapore. With the upcoming summit between U.S. President Donald Trump and North Korean leader Kim Jong Un now scheduled to be held in Singapore on June 12, there are increased expectations that an agreement will be reached to dismantle the North’s nuclear, missile and chemical weapons programs that threaten the U.S. and its allies. Details over the scope and timing of the denuclearization process must still be worked out, but the North Korean leader has indicated he wants to resolve the dispute to focus on improving the economic conditions of the country. Ending the severe U.S. led sanctions banning 90% of North Korean trade that were imposed for the North’s repeated nuclear and missile tests, would open the door to increased economic investment and cooperation. Humanitarian assistance has been exempted from the economic sanctions, but Beasely said import restrictions has made it more complicated to bring in aid, and made potential donors reluctant to contribute for fear of inadvertently violating sanctions. Beasley’s North Korean itinerary included trips to WFP funded projects, including a children's nursery in South Hwanghae province, located near the inter-Korean border, and a cookie factory in North Pyongan province, near the border with China. In the last year the WFP has made over 1,800 site visits to assure that aid provided went to those who need it most. The WFP director said poverty and food shortages were prevalent, particularly in rural areas. “Going from village to village while we did not see starvation, there were clearly issues of under-nutrition or malnutrition,” he said. FILE - People work in a field just outside Pyongyang, North Korea, May 4, 2016. WFP provides food aid to an estimated 650,000 women and children in North Korea every month, although funding shortfalls, the organization says, have caused rations to be reduced or suspended in some cases. The WFP is hoping to greatly increase food aid to North Korea after a nuclear deal is reached and sanctions are revoked. But Beasely said the leadership in Pyongyang must provide even greater access and transparency to clearly demonstrate the need for assistance, and to assure donors that their contributions will go to those who need it most. “I said very clearly that we want to work with you, we want to help you, but you must help us,” said Beasely. The U.S. provided North Korea significant food aid in the 1990s to ease severe famine conditions that caused widespread starvation and deaths that were due in part to the loss of Soviet support and a failed communist agriculture model that caused food production to decline. 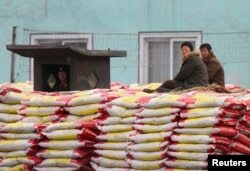 FILE - People sit on sacks of fertilizers as a North Korean soldier stands guard on the banks of Yalu River near the North Korean town of Sinuiju, opposite the Chinese border city of Dandong, Jan. 29, 2014. However Washington ended the bilateral aid program later due in part to concerns that assistance was being redirected to support the North Korea’s military, and to free up more resources for the country’s nuclear development program. North Korea currently produces five million metric tons of food a year, but the WFP estimates it needs between six and seven million metric tons annually to feed its population of 25 million. Around 10 million North Koreans suffer from malnutrition or under-nutrition, according to the WFP director. Farmers in North Korea also face significant hardship in producing enough food for the population, with only 15 to 20 percent of land suitable for agriculture in the mostly mountainous terrain, and often lacking fertilizers and modern tractors to cultivate the fields. In recent years North Korean leader Kim Jong Un instituted agricultural reforms allowing farmers to keep or sell a portion of what they produce. These financial incentives have been credited with helping to stabilize food production despite floods and droughts that regularly occur.